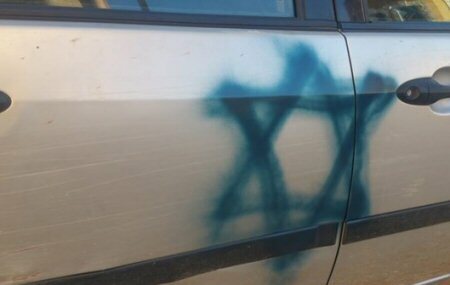 Extremist Israeli settlers vandalized several Palestinian vehicles in al-Lubban al-Sharqiyyeh village, south of the northern occupied West Bank city of Nablus, on Wednesday morning. Ghassan Daghlas, an official who monitors settlement activity in the northern West Bank, told Ma’an News Agency that Israeli settlers from the Maale Levona illegal Israeli settlement raided the village, spray-painted racist graffiti and the Star of David on three vehicles. Locals chased the settlers, who then managed to flee the village. Known as “price tag” attacks, extremist Israeli settlers carry out violent acts of punishment on Palestinians and their property to demonstrate their opposition to Israeli restrictions on settlements and outposts in the occupied West Bank and Palestinian towns and villages in Israel.